The basis for the word salad is 'sal', meaning salt. This was chosen because in ancient times, salt was often an ingredient in the dressing. "Although the ancient Greeks and Romans did not use the world "salad," they enjoyed a variety of dishes with raw vegetables dressed with vinegar, oil, and herbs...the medical practitioners Hippocrates and Galen belived that raw vegetables easily slipped through the system and did not create obstructions for what followed, therefore they should be served first. Others reported that the vinegar in the dressing destroyed the taste of the wine, therefore they should be served last. This debate has continued ever since...With the fall of Rome, salads were less important in western Europe, although raw vegetables and fruit were eaten on fast days and as medicinal correctives...the term salade derived from the Vulgar Roman herba salata, literally 'salted herb'. It remained a feature of Byzantine cookery and reentered the European menu via medieval Spain and Renaissance Italy. At first "salad" referred to various kinds of greens pickled in vinegar or salt. The word salade later referred to fresh-cooked greens of raw vegetables prepared in the Roman manner." Thank you, Anna at Crunchy Creamy Sweet for the "One Lovey Blog Award". I am honored. This means the world to me. Thank you so much for thinking about me. Thank you, Suzi for nominating me for the "Excellence in Story Telling Award". This means the world to me. Thank you so much for thinking about me. 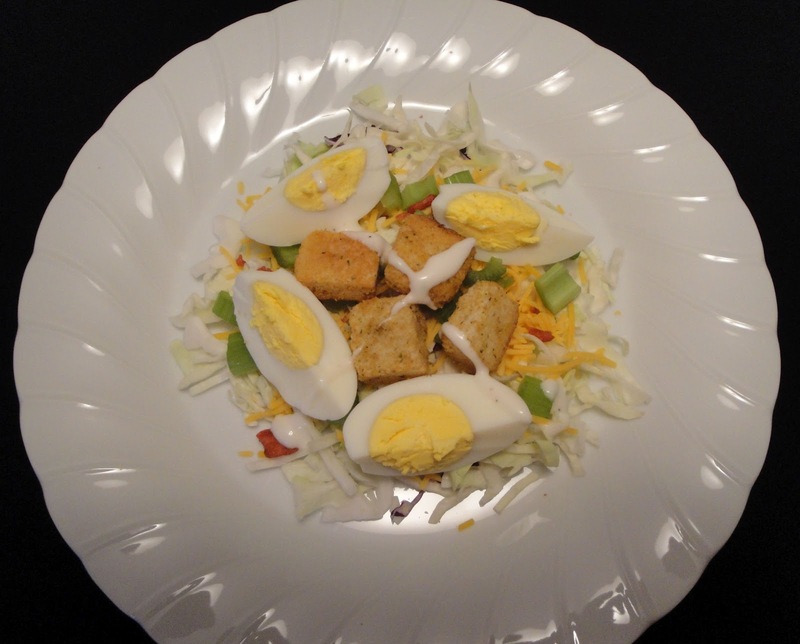 Divide the coleslaw, cheddar cheese, celery, hard boiled eggs, croutons and bacon bits between 4 dinner plates. Drizzle your favorite salad dressing. Enjoy! I had no idea how the name derived. Interesting! And I love a simple salad! What a great story about salad... I love knowing that now. :) Congrats on all the awards. A brilliant history lesson, and a lovely easy salad! Thank you! interesting story, you deserve the award:) I should try to eat more salad and less cakes! A simple and delicious salad. I would love it too. Simple but filling. Hard boiled eggs are always a nice edition to a salad. You have such a way with simplicity! This salad looks great ... perfect served up with your history lesson and food story ... congrats on your nomination! I have the very similar salad. But yours is super delicious!Yummy.